Hey there! I have a new layout created for the Pink Paislee blog to share today featuring my Whimsical collection and Rainbow cut file! 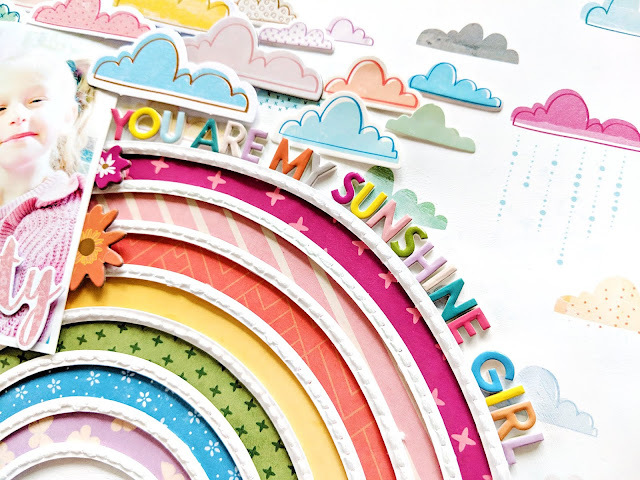 I started by die cutting my Rainbow cut file from thick, smooth white cardstock using a Silhouette Cameo 3. Then I took some time to pierce a hole every 1/8" or so across the rainbow and backstitched through it using all 6 strands of DMC white embroidery floss. It took me about 2 hours to stitch the entire rainbow - I love the texture it adds! 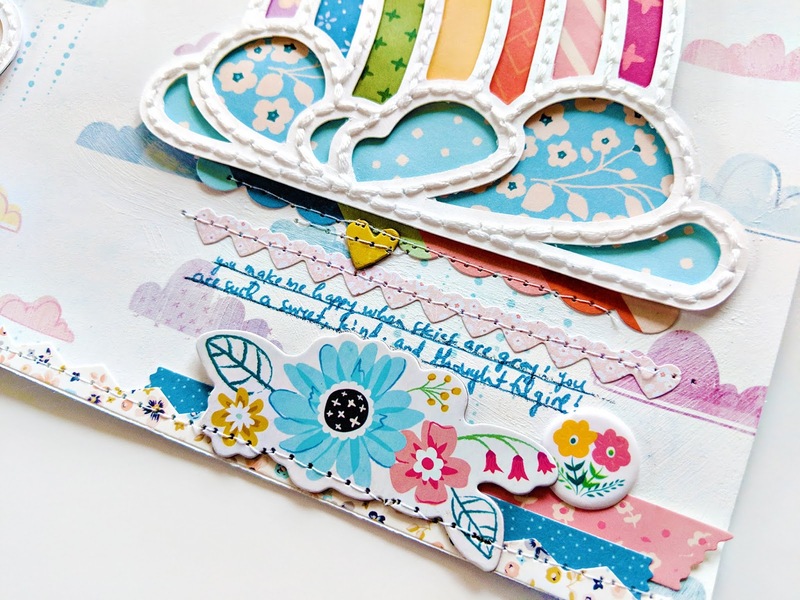 Then I used the cut file to make the backing pieces from literally a rainbow of patterned papers! I used liquid glue on the back and placed the pieces where they belong. Easy peasy! I chose Paper 15 as my background and toned down the bottom half of the clouds with gesso. I added the rainbow on top and placed a photo over the top left side. 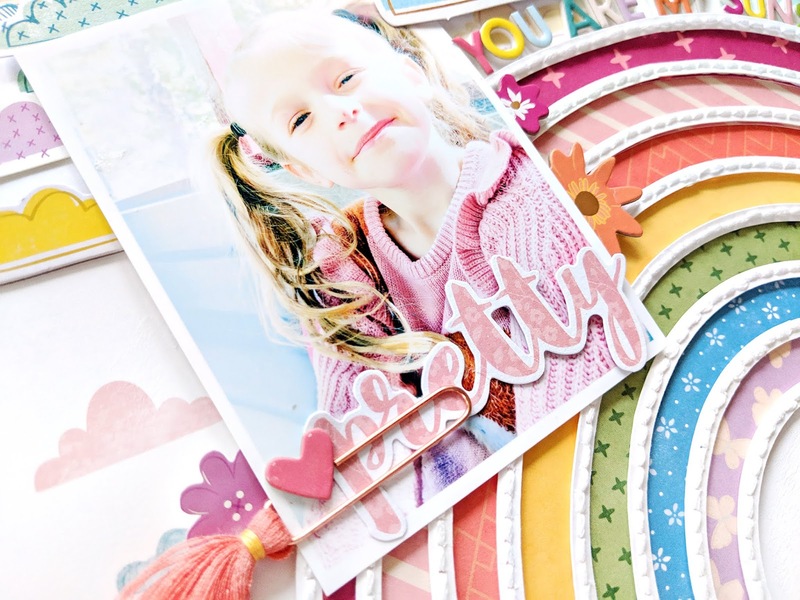 I made the title with the rainbow Foam Mini Thickers around the curve of the rainbow and attached a "pretty" Ephemera Die Cut with a pink Tassel Paper Clip to the bottom left side of the photo. I added a couple flower Chipboard Stickers and a paper flower Sticker under the photo. 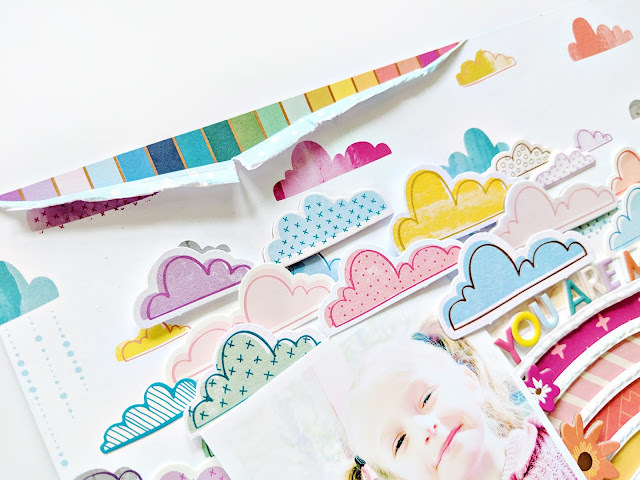 Above the photo I added alllll of the clouds I could find from the Chipboard Stickers, Ephemera Die Cuts, Puffy Stickers, Stickers, and Sticker Book to reiterate the cloud theme. To balance everything going on on the top left I added embellishments to the bottom right included border Stickers and a floral Chipboard Sticker. I also wrote my journaling with a blue pen in this area. Because of the gesso the stickers didn't stick too well so I used a sewing machine to stitch everything in place. To finish I tore the top left edge and backed it with a piece of the rainbow striped/gold foil paper in the 6x6 Paper Pad - I love how the colors tie in with the rainbow. 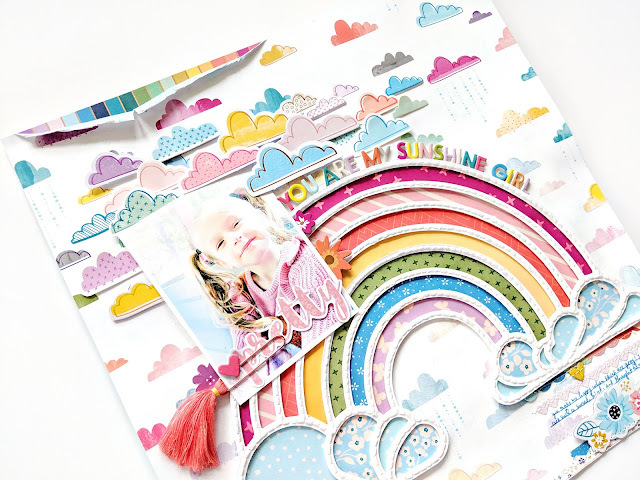 I hope this layout has inspired you to pick up the Whimsical collection and make a rainbow page! This is STUNNING! I love love love love that rainbow and those clouds!!!!!!!!!!!!!!!! !